We are very excited about this update. Custom fonts, Visibility feature, dramatic performance improvements, we killed those annoying empty spaces, the page will not scroll to top while you are designing and tons other fixes and improvements. 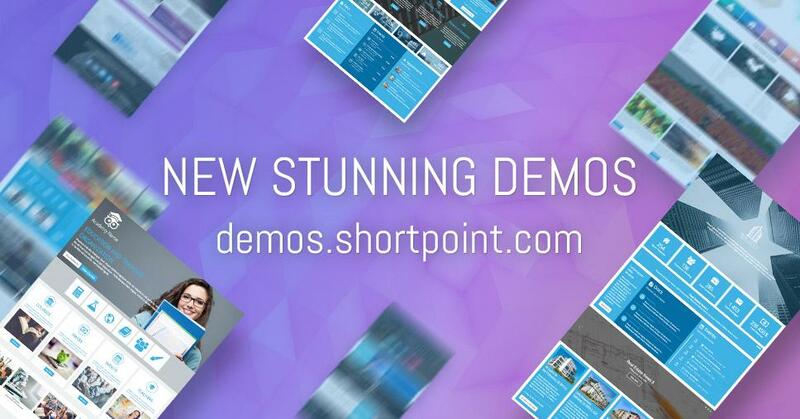 We also received tons of feedback from our awesome community on ShortPoint 5.0 that we released in Feb. Everybody is in love with our new branding tool. The easiest way in the world to add your dream font to your dream SharePoint site. Now you can control who will see what and where. We called it visibility because not everything has to be visible to everyone and on every device. For example, you can add two different versions of your page header. One for desktop, and another one for mobile devices. You can also add Tiles to your page, and set one of the tiles to be visible only to all users in Sales and Marketing SharePoint users group. Now you can easily add Section ShortPoint to the page, and force it to move all the way to the top and cover the SharePoint header. Important! Make sure to enable Force Top on the first section in your page only. Great for building beautiful landing pages. We are continuously working to improve the performance in ShortPoint. Now branding and site customization features are 4 times faster, pages will load much faster now as well. We have also added a new option to Section ShortPoint, it’s called: Lazy Render. This is great if you designed a very long page. Enable this option at the sections in the second half of the page, will delay their loading until the first part of the page being fully loaded. In next version, we will improve the performance of the connected and dynamic ShortPoints. External Content Type: Now ShortPoint connect can read data from External Content Type lists. Mobile Settings: New Options added to Mobile Settings in branding feature. Now you can control basically everything. We have revamped our live demos website. Check our the new designs for education, real estate, technology, travel and new demos and documentation for every ShortPoint. Hide side menu used to hide the sidebar even if it does not contain a menu. Hide side menu will work only on Pages, not on settings, search, _layout or lists pages. Fixed issue when Custom CSS Link was loaded after ShortPoint render. Edit ShortPoints did not work from the first time and caused the browser to scroll to bottom when clicking the edit ShortPoint button. Homepage elements now detect the site home page automatically.